I bought some HobNobs yesterday. While it’s tempting to leave this post there, it was for a very good reason: a vicar was on the way to our house for a pre-wedding meeting. I figured we’d need lots of tea and loads of biscuits. 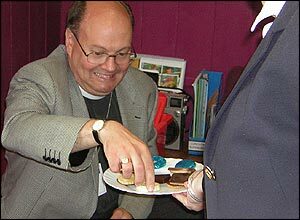 This was on the basis that all previous meetings I’d held with vicars involved tea and biscuits. The latter seemed of primary importance at these meetings (alright, there’s only been one) and were displayed with Michelin star precision. I wanted us to impress. Like we knew what we were doing when it came to biscuits and, obviously, God, and stuff. I’d needed to visit the shop for other items, but the biscuits were top of the list. They were that important. Our lady vicar duly turned up and, after the usual pleasantries and tripping over of the dog, we settled down in the living room. ‘Yes please. No sugar, just milk,’ she replied. The first catastrophic holy hospitality failure happened when I couldn’t find a clean teaspoon. The only one which could be described as marginally clean was already in the dish washer, resting against the fork I’d used to prepare the dogs dinner and encrusted with beef, liver and all the chewy bits they extract from cows which are only fit for dogs. I retrieved the spoon, checked she wasn’t watching (and offered a quick glance above to ensure He wasn’t, either) and wiped off the bits of intestine with the tea towel. Then, I discovered we’d run out of sensible mugs. The only ones we had left were Sponge Bob Square Pants, Pink Floyd’s The Wall and one ‘proudly’ displaying a cheesy photo of Lindsey and myself on the London Eye. None were suitable for a priest. Thankfully, I managed to find a couple of normal ones but had to plump for the Pink Floyd one myself. It was least offensive, after all. We didn’t know what to expect from the meeting. My best man had informed me that we would be made to sit through a video depicting the perfect marriage and how we should treat each other in years to come. You know, how we should not get divorced, ensure we go to church and definitely have two children called Jack and Sophia. I had already devised a plan for this. Our DVD player, I would say, is fucked. Well, maybe not in those exact words, but I would make it quite clear that it would not do the job for which it is intended and that we have absolutely no other means of displaying said video. I even considered bashing the DVD player up a bit with a hammer to give my bare-faced lie some credibility but conceded He might be taking note. Thankfully, the DVD did not appear. A CD fell out of her bag at one point and while its double sidedness gave me a sudden glimmer of hope that it might, in fact, be The Wall and therefore give us some common ground on which to muse (and provide material for her little talk at the wedding ceremony – you know: ‘I’ve been getting to know Mark and Lindsey over the last few weeks and was delighted to discover that Mark and I share a common love of Pink Floyd’s post-Barrett work’), I realised it was more likely a hymn collection. Or possibly a Michael Bolton double album, which is essentially the same thing. I’m not sure why I was so anxious about the arrival of a priest at our house. We’ve got nothing to hide. I’m not against religion. I wasn’t alone in my unease, either. At the eleventh hour, Lindsey had suggested we need something resembling a cross in our living room and asked if I could ‘fashion something out of some wood from the garden’. The only wood we have in the garden is decking and the resulting cross would therefore be an exact scale replica of the very one Jesus was nailed to. That would look a little odd wedged in our living room. Our dog, Eddie, didn’t appear to be quite so apprehensive. The first thing he did on her entering the room was fart and then, as we were halfway through discussing the order of service, decided to sit on the vicar’s notebook, his bum resting neatly on our choice of hymns. After a while, she left. I headed back to the kitchen and stopped dead. My heart sank. There, on the top of the fridge were the biscuits. Unopened. Un-shared. Wasted.